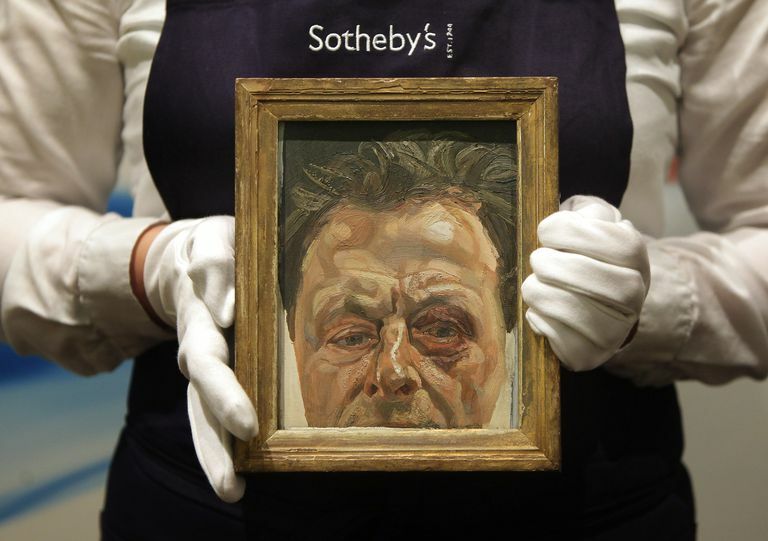 Lucian Freud is the grandson of Sigmund Freud, the pioneer of psychoanalysis. Born in Berlin on December 8, 1922, he died in London on July 20, 2011. Freud moved to Britain in 1933 with his parents after Hitler came to power in Germany. His father, Ernst, was an architect; his mother the daughter of a grain merchant. Freud became a British national in 1939. In 1948 he married Kitty Garman, daughter of the British sculptor Jacob Epstein, but the marriage didn't last and in 1952 he married Caroline Blackwood. He started working as a full-time artist after being invalided out of the merchant navy in 1942, having served only three months. Today his impasto portraits and nudes make many regard him as the greatest figurative painter of our time. Freud prefers to not use professional models, to rather have friends and acquaintances pose for him, someone who really wants to be there rather than someone he's paying. From 1938-1939, Freud studied at the Central School of Arts in London; from 1939 to 1942 at the East Anglian School of Painting and Drawing in Dedham run by Cedric Morris, and from 1942-1943 at Goldsmiths' College, London (part-time). From 1946-47 he painted in Paris and Greece. Freud had work published in Horizon magazine in 1939 and 1943. In 1944 his paintings were hung at the Lefevre Gallery. In 1951, his Interior in Paddington (held at the Walker Art Gallery, in Liverpool) won an Arts Council prize at the Festival of Britain. Between 1949 and 1954 he was a visiting tutor at the Slade School of Fine Art, London. Freud had a studio in Paddington, London, for 30 years before moving to one in Holland Park. His first retrospective exhibition, organized by the Arts Council of Great Britain, was held in 1974 at the Hayward Gallery in London. The one at the Tate Gallery in 2002 was a sell-out, as was the major retrospective at the London National Portrait Gallery in 2012. According to critic Robert Hughes, Freud's "basic pigment for flesh is Cremnitz white, an inordinately heavy pigment which contains twice as much lead oxide as flake white and much less oil medium that other whites." "I don't want any color to be noticeable... I don't want it to operate in the modernist sense as color, something independent... Full, saturated colors have an emotional significance I want to avoid."